This double truss podium is a soft silver and available with a 37" LCD display for $575. Your graphics on a thumb drive will brand your podium or attach your presentation or other video source. Classic wood podium so named because the character "Borat" used two of these podiums for his movie. The rear of this podium is open to accept wheelchair access, the height can be adjusted to the speaker's preference by using a simple electronic switch from 38" to 46" high from the floor. This podium is a unique faux marble finish, a certain stand out piece for our stage. Add 3-piece or single piece columns for the complete look. This podium is equipped with a slide out side table and also a pull drawer for that speaker with more than just a speech. A single gray truss supporting a vertical 37" LCD to be used with you thumb drive for any graphics, logos or imagery you may need. 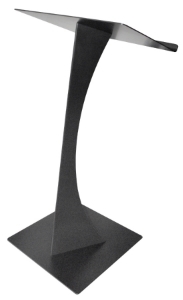 This adjustable height lectern is great for the small meeting. Adjustable from 26" - 41". Lightweight, making it easy to move, which is great for accommodating the guest speaker who likes to pace! The Blade is sleek, bold and a perfect choice for those tech conferences. It is lightweight enough to be moved to the side in case on stage theatrics command presence and also has a 26" wide top to support three sheets of paper, side by side. The Coal Truss is another triangle truss upright in all black. A wooden base and top piece are rugged look for those stage sets that have a burly, gritty edge to them.